Chuck Hagel is a former Republican senator from Nebraska, nominated to the office of Secretary of Defense by President Obama on January 7th, 2013. The pick has raised concerns across party lines due to controversial decisions of Hagel’s from the past. Most of these concerns lie in Hagel’s opinions on foreign policy, specifically US relations with Israel, Iran, and Iraq. However, the confirmation hearing held this past Thursday was not much more than a grown-up version of a bunch of bullies cornering a small child on the playground and forcibly seizing his lunch money and dignity. Many questioners during the hearing chose to dredge up former statements Hagel made in the past in an attempt to make him seem backwards and old-fashioned. Some reporters found merit in these accusations, and jumped at the disparity between what Hagel has said in the past and what he espouses now. At the forefront of criticism is an anti-gay comment Hagel made in 1998, for which he has since apologized. I am of course not justifying this comment, nor do I intend to explore its further implications, as discussing the involvement of personal views of senators and other political higher-ups in law-making opens up a whole different world of ethical disparities. This throwaway comment made 15 years ago is relevant in a broad sense, but does not sway the scales enough to make the difference between appointing or not appointing Hagel. In a similar vein, dissenters have also disapprovingly cited Hagel’s reference to Israel supporters as “the Jewish lobby.” Hagel, not a man to shy away from self-correction, has already apologized for these slip-ups and has since evolved to a higher threshold of political correctness. These arguments against him are simply evidence of grasping at straws, especially when considering the Israeli government has a history of using the same terminology. There were many issues the questioners decided not to discuss, which (perhaps unintentionally) cast a somewhat ignorant light on the whole affair. There may be valid cause for the dissenters’ concerns, but if the opposition is truly up in arms about Obama’s nomination, it seems more logical to investigate every facet of American life that will be affected by Hagel’s appointment, not just his previous stance on US relations in the Middle East. So, did Hagel’s questioners ask anything relevant or pressing? Iran and Iraq were mentioned dozens of times as the hours of the confirmation hearing ticked on, but little, if anything, was said about domestic issues or the current situation in Afghanistan. The majority of the hearing seemed to be hours upon hours of angry old white men hurling elaborately worded accusations against Hagel, and loudly interrupting whenever the man tried to answer. 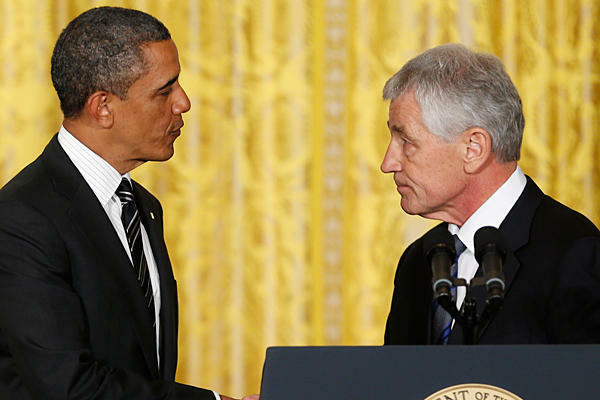 President Obama and Hagel at Hagel’s nomination announcement on January 7, 2013. This pattern appeared at the very inception of the hearing by Oklahoma Republican James Inhofe, and was then perpetuated by none other than Arizona senator John McCain, a fellow Vietnam veteran and former friend of Hagel. McCain asked Hagel what he seemed to think was a yes-or-no question (hint: it wasn’t), and was supremely dissatisfied when Hagel attempted to give anything but a one-word answer. As a result, Hagel was barely able to get a word in edgewise. Some reporters joked that perhaps Hagel was not prepared for the eight-hour pop quiz he encountered, while others commented on the apparent lack of his usual charm. However, when Hagel did voice an opinion, he did so strongly and passionately, making it clear that he is committed to the position to which he is being appointed, and the administration for which he will be working. As The Huffington Post’s Robert Naiman has pointed out, Hagel has not backed down or equivocated on certain issues which do not conflict with the views of the current administration. The prime example provided in Naiman’s article is Hagel’s opinions against separating victims of terrorism; Hagel made it acutely clear that he did not believe in such a separation, whether victims be Israeli or Palestinian. 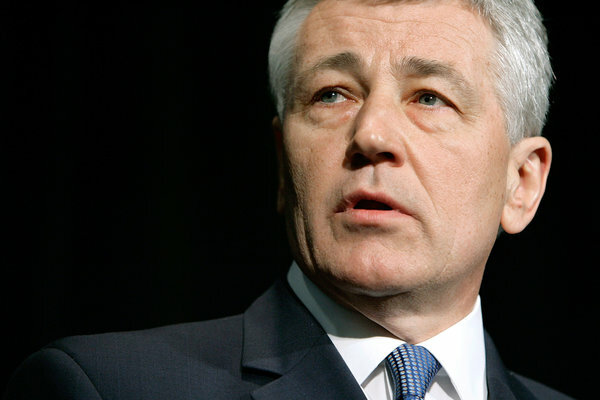 Hagel himself stated that if appointed he will “ensure we maintain the best fighting force in the world, protect our men and women in uniform and ensure that we are cautious and certain when contemplating the use of force.” As a Vietnam veteran and recipient of two purple hearts, Hagel is, in some opinions, more qualified to speak for those overseas. This point of view is a double-edged sword, though; it seems to make sense, for how can one subject others to the horrors of war without personally having been there? Yet by this logic, the women of Capitol Hill are deemed not worthy to have an opinion on overseas military operations, a vastly backwards way of thinking. Hagel’s military involvement seems to be a strong source of personal identity, however, and makes clear his goals for the position. After reflecting on countless news pieces and editorials, I have concluded that Hagel seems to have accomplished what the administration wants him to accomplish. He has not spoken against the administration, the arguments against him are somewhat weak, and there has never been an official in a position of power who has not said or done something controversial in their career; if they were perfect, doesn’t that lead the subconscious to somewhat trust them less? Humanity is poetically imperfect, after all. The day-long crusade against Hagel seems to be another episode in the ever-increasing line of bipartisan byproducts, but ultimately it shouldn’t affect Hagel’s appointment to office.